Taiseki-ji (大石寺; full name, 多宝富士大日蓮華山大石寺: Tahō Fuji Dainichirenge-zan Taiseki-ji) is the head temple (総本山: sōhonzan) of the Nichiren Shoshu school of the Nichiren branch of Japanese Buddhism. It is located on the lower slopes of Mt. Fuji in Fujinomiya, Shizuoka Prefecture, Japan. Taiseki-ji was founded in 1290 ce by Nikkō, one of Nichiren‘s immediate disciples. In addition to being Nichiren Shoshu’s head temple, Taiseki-ji is the school’s administrative center, and its chief abbot is simultaneously the high priest of Nichiren Shoshu. The temple is visited by several hundred thousand pilgrims a year, and its compound is known for several historically significant buildings, its gardens, and the old weeping cherry trees that line its tatchū (main path lined with lodging temples). In addition to being Nichiren Shoshu’s head temple, Taiseki-ji is also its administrative center, and the high priest (法主: Hossu) of Nichiren Shoshu doubles as the temple’s chief abbot (貫主: kanzu). The temple’s and school’s current head is High Priest Nichinyo Hayase (1935–). High Priest Nichinyo assumed the position on December 16, 2005, and is the 68th in a lineage Nichiren Shoshu traces back to Nichiren (1222–1282). He is commonly styled 68th High Priest Nichinyo Shōnin in English. Because it is the head temple of Nichiren Shoshu and therefore home of the Dai-Gohonzon, Nichiren Shoshu’s ultimate object of veneration, Taiseki-ji is visited by believers from all around the world who come on personal pilgrimages, to participate in regular ceremonies, or to take part in large events such as temple-group pilgrimages, workshop-like study programs, and large rally-like meetings. Events in bold are positioned as the two most important ceremonies of the year. According to Nichiren Shoshu tradition, Taiseki-ji was founded in 1290 by Nichiren’s disciple Nikkō on a tract of land called Ōishi-ga-hara (大石ケ原) donated by the district steward, Nanjō Tokimitsu (1259–1332). The name derives from an alternate reading of the kanji for Ōishi (大石), taiseki, and ji (寺), which means temple. Tokimitsu was one of Nichiren’s lay followers and he looked up to Nikkō as his personal teacher. It started with one small temple building but grew gradually as Nikkō’s disciples built sub-temples. It went through further growth phases during the mid-Edo period and in the post-World War II period. The Sanmon (三門, sometimes 山門) gate is Taiseki-ji’s «front door» and has been designated as a prefectural cultural asset. It was built in 1717 with donations from Tenneiin, the wife of sixth Shogun Tokugawa Ienobu. The first Mutsubo (六壷) was erected in 1290, making this historically Taiseki-ji’s first building. Has has been rebuilt many times since. The current structure, which uses much keyaki heartwood, was completed in 1988. The Daikyakuden (大客殿: «Grand Reception Hall») was first built in 1465. The current structure, a wood-clad steel-framed structure, was completed in 1998 and replaced previous steel reinforced concrete building built in 1964.. A pre-war building, which had been requisitioned by the military, burnt down in a June 1945 fire that claimed the life of 62nd High Priest Nikkyō. 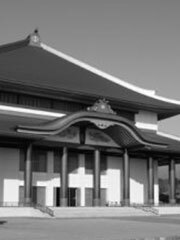 The Grand Reception Hall is the site of ushitora Gongyo, a prayer service performed daily at the transition from the «hour of the ox (ushi)» to the «hour of the tiger (tora)». The service begins at about 2:30am and ends about an hour later. This is believed to mark the transition from «darkness» to «light» as well as the hour at which all Buddhas attain enlightenment. The service is customarily officiated by the high priest or his proxy. During the service, the officiating priest sits at the front of the room, to the left of and facing the congregation of priests and laity gathered in front of the altar. This signifies that he is «guiding» the congregation to the Gohonzon so they can achieve enlightenment. The purpose of the service is, among other things, to pray for the spread of Nichiren Shoshu throughout the world and thereby bring about peace and prosperity for all humankind. The original Mieidō (御影堂: «image hall») was built in 1522. The Mieidō houses an image of Nichiren (hence its name) dating from 1388. The current, classical structure was built in 1632 and has had several subsequent renovations, the most recent major one in 1971. It was designated a cultural asset by Shizuoka Prefecture in 1971. The Hōandō (奉安堂: hōan is an honorific form of a verb meaning to enshrine or place in an altar; dō is a large building or hall) houses the Dai-Gohonzon, the supreme object of veneration in Nichiren Shoshu. The Hōandō is built in the style of a traditional Japanese storehouse to signify that kōsen rufu (広宣流布) has yet to be achieved. Loosely defined, kōsen rufu means that the Nichiren Shoshu faith has taken hold as the primary religion of the world’s people, a situation believed to have be achieved when about one-third of a population believes in Nichiren Shoshu, another third knows of it but is not hostile, and the remaining third is ignorant of it to some degree or another. This is significant to the Nichiren Shoshu faithful because they believe that, according to Nichiren’s will, the Dai-Gohonzon is not to be made publicly accessible, but rather «stored away» and only viewed by those who have asked for and been granted an audience by the high priest, until kōsen rufu has been achieved. A further symbol of this is that, different from all other Nichiren Shoshu altars, the one in the Hōandō is not decorated with an offering of evergreens, and non-believers are permitted in the building only on special occasions. The Hōandō replaced the Shōhondō (正本堂: «the true main hall»), the Dai-Gohonzon’s previous home. Before the Shōhondō was completed in 1972, the Dai-Gohonzon had been kept locked away in a storehouse called the Treasure House (御宝蔵: Gohōzō) or enshrined in the Hōanden (奉安殿), another storehouse-like structure built behind the Treasure House. Completed in 1749, Taiseki-ji’s pagoda faces west rather than the usual south to signify that Nichiren Buddhism would spread from the east (Japan) to the west (back to the land of Sakyamuni Buddha and beyond). It is the largest five-storied pagoda along the Tōkaidō Highway. The structure was designated a national cultural treasure in 1966. It is opened every February 16 for ceremonies to celebrate Nichiren’s birthday. The previous structure was built and donated by Soka Gakkai in 1964. It was ostensibly replaced because of worries about structural integrity in a major earthquake. Its imposing ferroconcrete mass was also cited as incongruent with the architectural tone appropriate for a temple compound.